MLS® Update – Are you ready for The Shift? Have you been reading about the changes coming to RAHB’s MLS® System before the spring market of this year? RAHB’s own Matrix system will be making an appearance in the next few months, and RAHB has been providing information to you about how you can prepare for the change. Be sure to watch your email inbox for issues of The Shift, our specialty publication about all things Matrix. If you’ve missed some issues, you can find them in REALTOR Link® – just look for the link to The Shift on the right hand side of our home page. Five fields in Fusion will become mandatory! Total Area will be mandatory for all commercial property types, excluding business-only listings. The information will be required in the “Total Area” line on the current RAHB Property Information Form. Heat Source will be mandatory for all residential property types. Use the field for “Fuel” on the current Residential Property Information Form. Square Footage & Square Footage Source will be mandatory for all residential property types. Place the information in the “Square Footage +/-” line on the current Residential Property Information Form. You can write the source of square footage underneath. Assessment Roll Number will be mandatory for all residential and commercial property types. 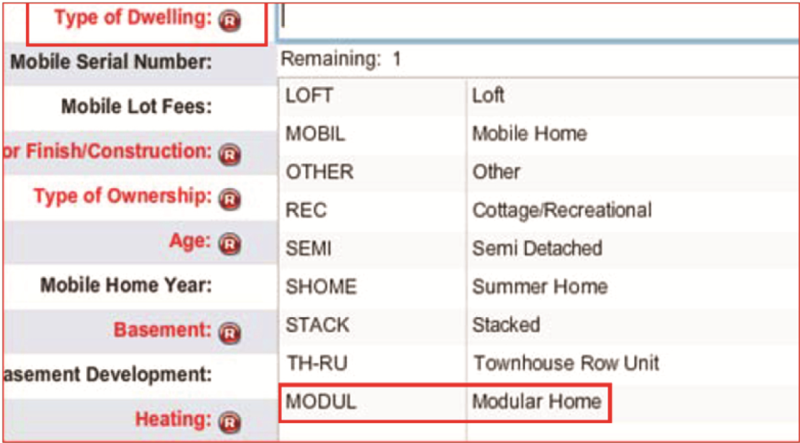 Enter the information in the “Roll #” section of the current Property Information Form. Zoning for listings located in Brantford, Cambridge, Guelph, Kitchener-Waterloo, Niagara, Oakville/Milton and Simcoe. This will apply to all residential and commercial property types in these areas. Zoning will not be mandatory for listings located in the RAHB area. For full information about about the five mandatory fields and where to find the information, plus new information about changes to “For Lease or Sale” listings, view the full version of the December 19, 2016 issue of The Shift here or view the December 19 issue of The Shift in REALTOR Link®. The NEW GeoWarehouse is here! As of Monday, December 5, 2016, when you visit GeoWarehouse through RAHB’s single sign on, Fusion or Matrix, you will land on the NEW version of GeoWarehouse. While GeoWarehouse will not be fully cutting over to the new version until January 2017, they are giving you the chance to become familiar with this new version well ahead of time. You will still be able to navigate to the more familiar version if you prefer, but you will always be landing on the new version when you visit the site. When your listings are submitted to Fusion and uploaded to Matrix, the listing number assigned by Fusion receives an “X” at the beginning of the number when it appears in Matrix. So a listing H1234567 in Fusion becomes XH1234567 in Matrix. When your clients view their listings sent from Matrix to their client portal they will see the MLS® numbers prefixed with the “X”. If your clients are searching for their listing on REALTOR.ca, they will not be able to find it with the listing number beginning with “X”. You should let them know that they can find their listing on REALTOR.ca by omitting the X from the beginning of the number. A Matrix icon has now been added to your SSO dashboard, giving you a short and easy way to access Matrix. It is the first icon in the “Resources” section of your dashboard. By now you’ll have heard that RAHB is participating in the development of a regional MLS® system and “shift”ing to a new MLS® platform – Matrix. To help you prepare for The Shift, we will be emailing regular updates with news, training information, links to helpful website and more. Watch your email inbox for future issues of The Shift! RAHB has been notified that the Brantford Regional Real Estate Association (BRREA), Simcoe District Real Estate Board (SDREB) and Niagara Association of REALTORS® (NAR) are planning to go fully-live on Matrix on May 10, and will stop using Fusion at that time. Those organizations have decided to do this prior to RAHB fully cutting over. RAHB will support those organizations during the cutover process so any impact to our and their members is minimal. To access Matrix, visit http://onregional.ca or click the link from your SSO dashboard. Just remember – even though you can access Matrix through your dashboard, you will still have to sign in with your Matrix user ID and password. Your Matrix user ID is the same as your Fusion user ID with “HB” at the beginning. RAHB will not cut over to Matrix until sometime after the spring market, as explained at last month’s AGM. Until that time, please continue using Fusion to input and edit listings. Please note that Fusion listings are automatically uploaded to Matrix every 15 minutes. In Matrix, the “Sold” status is broken down into two separate statuses: “Sold Pending” and “Sold Closed”. Matrix allows you to put aside listings for review at a later time. When you are viewing a listing that you would like to review later for a client, or put aside for use as a comparable, click on “Carts” from the “Actions” menu located at the bottom of your screen. You will then be given a list of carts that you can add the listing to. You have one cart for each property type, and one for each client. For the client carts, you can put aside listings that you feel your client may be interested in, but may fall outside of their search criteria. At any time, you can open the client’s cart from your home page (or from the contacts list), and e-mail some (or all) of the listings in the cart. The system will automatically keep track of when you emailed the listing to your client, and will display the date the listing was e-mailed beside the listing, or it will read “Never” if the listing has never been emailed. For a video tutorial on using carts in Matrix, visit https://youtu.be/rVH6XHVmH4A. Please note: the development of the regional MLS® system is a work in progress. All information provided in the issue of The Shift is correct as of April 27, 2016. Use Matrix to search for listings! Did you know that Matrix is live and you can use it to search regional listings? Matrix is running in parallel with Fusion, so the Matrix listings search functionality is fully ready for use by all RAHB members. You should search using Matrix simply because Matrix contains all listed properties from the eight associations involved in developing the regional MLS® system, and that includes Oakville (OMDREB), Kitchener-Waterloo (KWAR), Guelph (GDAR), Cambridge (CAR), Brantford (BRREA), Simcoe (SDREA), Niagara (NAR) and RAHB. Fusion will also continue to have listings for those in the STARRS area (BRREA, SDREA, NAR and RAHB) during the parallel period. Update: As of May 10, the Brantford Regional Real Estate Association (BRREA), Simcoe District Real Estate Board (SDREB) and Niagara Association of REALTORS® (NAR) will be fully-live on Matrix and will stop using Fusion at that time. Listings will not be added to nor displayed in Fusion – they will appear only in Matrix. Until RAHB makes the final cutover to Matrix and retires Fusion, you must continue to broker load your listings into Fusion. This is because the listing add/edit functionality within Matrix is not yet enabled for RAHB. To ensure all RAHB area listings are showing up within Matrix, Fusion listings are automatically uploaded to Matrix every 15 minutes. The reverse is not true, however. When anyone who belongs to an association fully live on Matrix (currently OMDREB, KWAR, GDAR and CAR) loads a listing into Matrix, the listing is not copied to Fusion automatically. If their listing is located in the RAHB area (with the exception of OMDREB members – more about that later), members from those organizations could interboard their listing to RAHB, but not everyone does that, as history has shown. So, there could be listings located within the RAHB/STARRS area that are in Matrix but not in Fusion. This is where having access to Matrix is such an advantage – you can now search Matrix for all those listings which may not be on Fusion. So what does this all mean for RAHB members? This situation will exist until RAHB makes the final cutover to Matrix after the parallel period. In the meantime, there are things you can do to make sure you have the most information for your buyers and, if you are a dual member, the widest exposure of your listing for your sellers. • You can continue to search in Fusion, as you have always done. If you want to see if there are listings in the RAHB/STARRS area that may have been taken by a non-RAHB/non-STARRS member, then use your access to Matrix to do an additional search – that way you will have all of the information. You can use Matrix to enhance your searches. • If you prefer, you can do all of your searches in Matrix, where you will see all listings – those loaded into Matrix and those uploaded from Fusion. This would cut down on one step of your search, and produce the same results. • You will continue to use Fusion for broker loading and listing maintenance. If you haven’t been using Matrix, you can find help for how to navigate through Matrix and set up your searches in the Matrix Transition Guide or in the Matrix 6.12 Quick Start Guide, or watch a Matrix webinar. There will also be Matrix sessions at REALTOR® CONNECTIONS on March 23, and you can always call the RAHB MLS® Help Desk for assistance. • If you have a listing in the RAHB area, remember that the Access Agreement still exists, and you must still place your listing on Fusion. When you load your listing on Fusion, your listing will be automatically uploaded to Matrix, so you won’t have to enter it again into Matrix. • To make sure that RAHB members who choose to continue to only use Fusion, also see your listings, please also enter your listings in Fusion even if you have already loaded your listings into Matrix, or interboard your listings to RAHB. Please note that you may also enter your listing just in Fusion, and your listing will be uploaded to Matrix automatically since that process occurs every 15 minutes. Please note: If your listing is in another association’s area and the “out of area” code comes up as 999 in Matrix, RAHB staff are automatically notified and will create a duplicate listing in Matrix with the proper district or neighbourhood code. This will mean there are two listings for that one property in Matrix, but this is the only way to ensure your listing is searchable in the right location at the present time. RAHB has an Access Agreement with the Oakville/Milton association (OMDREB) and any listing that is in RAHB’s market area taken by an OMDREB member should be interboarded (via an access listing) by OMDREB staff to Fusion. However, OMDREB is the only association with that agreement with RAHB. RAHB-area listings taken by a member of the Kitchener-Waterloo (KWAR), Cambridge (CAR) or Guelph (GDAR) associations do not necessarily end up on Fusion as there is no agreement saying they must. The same is true for listings taken by members of other Ontario real estate associations, such as TREB. So the safe bet for you is to add using Matrix to your searches to find those listings that may not be in Fusion. One of the strengths of the Regional MLS® System is that members of the participating associations will have access to listing information for all properties listed in their areas and outside their areas, regardless of which participating member listed the property. The only way to benefit from that strength is to use Matrix, the regional MLS® system, for your searches. Please call RAHB’s MLS® Services Help Desk at 905.667.4650. Please note: the development of the regional MLS® system is a work in progress. All information provided in the issue of The Shift is correct as of March 15, 2016. Square footage will be a mandatory field in the new Regional MLS® System once we make the final cut over to Matrix. If the house you are listing has a builder’s floor plan, it is acceptable to use it. You should be aware, however, that the floor plan from before the house was built may differ from the actual floor plan that was built. While you can cite the builder’s floor plan, it may be worth your while to do a quick check to make sure the rooms are reasonably accurately represented. A more detailed search may produce the names and website of other companies that measure square footage. For those of you who will take your own measurements, you should know there is no standardized way of measuring the square footage of a house in Canada. There are, however, a number of recognized methods to measure square footage. The American National Standards Institute (ANSI), with the National Association of Home Builders, developed an American National Standard for Single-Family Residential Buildings. Their document has a good description of what goes into measuring square footage, although it doesn’t provide a lot of examples of measuring various types of houses. Read the guideline. The Appraisal Institute of Canada (AIC) has developed guidelines that are widely used; they can be found on REALTOR Link® under the MLS® tab or here. They are very similar to the ACRE method developed by the now-defunct Alliance for Real Estate Education (ACRE) and which is still included in the reference guide OREA issues in the Ontario licensing course. The ACRE method includes examples of a few more types of dwellings than the Appraisal Institute’s guidelines. An internet search for how to measure square footage brings up a number of sites – appraisers, bloggers, ANSI and more. There’s no question it would be easier if there was one, approved way to calculate square footage and a website to explain it, but there isn’t. If you check out those sites, however, most refer to one of the recognized methods mentioned above – ANSI, AIC or ACRE. What is probably most important, if you are measuring square footage yourself, is that you choose one of the recognized methods, understand the calculations and use that method consistently. If there are any discrepancies, you should be able to show that you diligently adhered to a legitimate way to calculate square footage. MPAC offers two reports that provide square footage – the Residential Floor Area Report and the Detailed Level 2 Report. (The links will take you to samples of the reports.) You can purchase the reports through the GeoWarehouse Store for $5 and $8 respectively. If you use any other source than those listed, you have to explain in the comments section of the listing what your source is. The most important thing to remember when you are determining the square footage of a property you have listed is that you have to do your own due diligence to ensure the information is reliable – you measure yourself, you have a professional measure or you use public or reliable builder’s plans. It is not enough to rely on the word of the seller or use the information from a previous listing; you should be checking the information yourself so you know it is accurate. When you are engaged with buyers and sellers as they purchase or sell a home, remember: you are the professional, so RECO will hold you to a high standard, the court will hold you to a high standard, sellers and buyers will hold you to a high standard and RAHB will hold you to a high standard. Members have been asking exactly what the differences are between property information forms used for Fusion and the data input forms that will be used for Matrix. If you look at the new Regional residential and commercial data input forms (there are links to the new forms below), they look completely different than the forms you are used to. It makes sense, because you can’t go from the five forms used for Fusion to two forms for Matrix, and expect everything to remain the same. Once RAHB makes the transition to Matrix, you will have to use the data input forms for Matrix – the property information forms for Fusion will not give you the information you need to broker load your listing information. It would be a good idea, then, to get to know two Matrix Regional MLS® data input forms before you need to start using them. Read the instructions and the guide that preceed the data input form; become familiar with which fields are considered mandatory; get a feel for the general layout of the form so that you are familiar with it when it comes time to fill out your first one. Check them out now – but remember you can’t use the new forms until you are able to broker load listings into Matrix. Please note: the development of the regional MLS® system is a work in progress. All information provided in the issue of The Shift is correct as of February 19, 2016. On January 19, 2016, an additional field called ‘Reserved Spaces’ was added to the Matrix system for Residential Property types. This field was added to accommodate previous listings from other MLS® systems which permitted text in the ‘Garage Spaces’ field. With text being allowed, some agents were inputting not only the number of spaces, but also the space assignment numbers (e.g “2,A123,B456” where 2 would be the number of spaces and A123/B456 would be the assigned parking spot numbers). Following the addition of the new field ‘Reserved Spaces’, the ‘Garage Spaces’ field data will be copied to the ‘Reserved Spaces’ field and then the ‘Garage Spaces’ field will be changed to a numeric entry only field. The reason for this change is to allow for a more accurate and flexible way to search for parking/garage spaces using the numeric input fields. Result: no easy way to predict what might be typed in the ‘Garage Spaces’ field, making it very difficult to search. Result: easier to search the ‘Garage Spaces’ field now that is a numeric value only. On January 19, 2016, the value ‘Oversized’ was added to accommodate oversized garages which are commonly referred to as a “1.5 Car Garage” or “One and a Half Car Garage”. Please note these changes are only in Matrix – this does not affect your listing entry into Fusion. As of Wednesday, January 6, 2016, users of the Regional Matrix system have been required to change their passwords. If you haven’t logged into the Matrix since January 6, you will find that when you log in, you will be redirected by Clareity Security to the “Change Password” page, where you will change your password. Your new password must contain a minimum of six letters and at least one number; your entire password must be between six and 10 characters. In addition to choosing a new password, you will be asked to answer three security questions. If this sounds familiar, this is the same process you went through to choose your Fusion password when RAHB began using Clareity Security three years ago. Please note: This new password is only for Matrix. You will continue to use your current password to access Fusion. Microsoft will end support for Internet Explorer 8, 9 and 10 on Tuesday, January 12, 2016. Microsoft will support IE 9 only on Microsoft Vista computers. This means that Microsoft will no longer be providing updates for these versions of Internet Explorer and significant security vulnerabilities may exist for users who continue to use them. Clareity Security software solutions will still permit logins from these browser versions, but limited support may be available because of Microsoft’s actions. If you don’t want to work with a browser that is no longer supported, we recommend you switch to Google Chrome or Firefox. The question mark ? can be used with a letter or number as a length delimiter. Exampe: p?? will return pow, pwr, pan, pic, pro, pub. The exclamation mark ! means “not”.Example: !3 in a field will give you all responses except those that equal 3. To select more than one item, hold down the CTRL key on the keyboard while clicking on the desired items with your mouse. To remove a selected item, hold down the CTRL key on the keyboard while clicking with your mouse and the item will deselect. On January 19, 2016, an additional field called ‘Reserved Spaces’ was added to the Matrix system for Residential Property types. This field was added to accommodate previous listings from other MLS® systems which permitted text in the ‘Garage Spaces’ field. With text being allowed, some agents were inputting not only the number of spaces, but also the space assignment numbers (e.g. “2,A123,B456” where 2 would be the number of spaces and A123/B456 would be the assigned parking spot numbers). Following the addition of the new field “Reserved Spaces”, the ‘Garage Spaces’ field data will be copied to the ‘Reserved Spaces’ field and then the ‘Garage Spaces’ field will be changed to a numeric entry only field. The reason for this change is to allow for a more accurate and flexible way to search for parking/garage spaces using the numeric input fields. On January 19, 2016, the value ‘Oversized’ was added to accommodate oversized garages which are commonly referred to as a “1.5 Car Garage or a One and a Half Car Garage”. Please note: personal reports you have created in Fusion will not be migrated over to Matrix. Please note: the development of the regional MLS® system is a work in progress. All information provided in the issue of The Shift is correct as of January 23, 2016. Thursday, December 10 – T, 9 a.m.
Friday, December 11 – T, 9:30 a.m.
Monday, December 21 – Wednesday, December 23. The RAHB office will be closed from 1 p.m.
Later this year, RAHB will be part of a regional MLS® system and members will have a bright, shiny new MLS® system and access to listing information of eight real estate associations (including RAHB). Read the answers to questions received from RAHB members – http://beta.realtorlink.ca/content/realtorlink/on/hamilton/en_CA/mls—-it/regionalmls/fyi.html (REALTOR Link®>MLS & IT>You Asked?